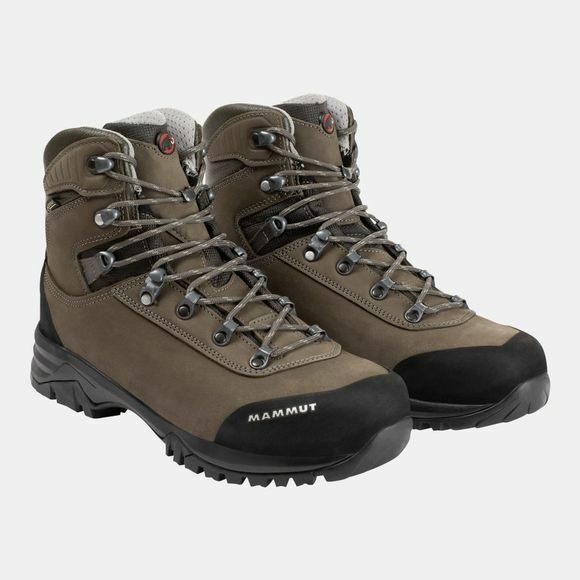 The Men's Trovat Advanced High GTX Boot from Mammut is a durable and sturdy walking boot that sits a little higher around the ankle and offers excellent protection and support for your foot while tackling long, difficult trails. The Gore-Tex Performance Comfort lining ensures a waterproof and breathable environment inside the shoe to keep your foot comfortable throughout the day while the 3-zone lacing offers a secure fit that is adaptable to your foot. The Memo Foam in the boot molds to the many contours of your foot once the lacing is in place to ensure maximum comfort. The Rolling Concept in the outsole optimizes natural anti-roll behaviour and helps reduce foot fatigue along with reducing the danger of a twisted ankle, while the Motion Control technology includes reinforced inner sides and enables lots of flexibility forwards and backwards despite the high lateral support. A tough boot that will mold to your foot to keep you comfortable throughout your chosen routes.